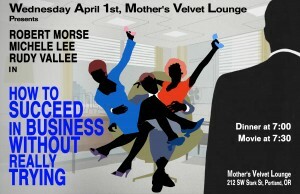 On Wednesday, April 1st, Movies at Mothers returns when we present the satirical 1967 send up of corporate America and mid-century values, How To Succeed In Business Without Really Trying, starring Robert Morse, Michele Lee, Rudy Vallee, and Maureen Arthur, and directed by David Swift. Window washer, J. Pierpont Finch (Robert Morse) happens upon a paperback book at a newsstand entitled “How To Succeed In Business Without Really Trying”. Scrupulously following its instruction he manages to net a job at the World Wide Wicket Company and, within a matter of hours, begins his rise up the corporate ladder. Through a combination of subterfuge, ingratiating behavior and the occasional knife in the back, Finch becomes a huge success and along the way even wins the heart of secretary, Rosemary Pilkington (Michele Lee). But as his ascent draws him closer to the orbit of the company’s president, Jasper B. Biggley (Rudy Vallee), the stakes become increasingly higher and he finds himself the target of a cadre of upper managers that vow to “stop that man, before he stops me”. As the poster graphics for this presentation suggest, it’s worthwhile to view How To Succeed In Business Without Really Trying through the filter of the TV series, Mad Men. It is certainly no accident that that series’ creator, Matthew Weiner chose Robert Morse (who won a Tony Award originating the role of Finch on Broadway) to play Bertram Cooper, the co-founder of the Sterling Cooper ad agency, as this film clearly served as a significant source of inspiration. Though certainly a less sober take of the hierarchical structure of American business in the 1960s, ‘How to Succeed…” is nonetheless equally critical of the abstraction of “selling the sizzle rather than the steak” that has served as the engine driving corporate behavior in the post WW2 era. The World Wide Wicket Company is populated by executives and middle managers (all men of course) who aren’t exactly sure what service or product their company provides, their focus being instead on climbing the ladder of success and establishing their position within a tenuous fiefdom. J. Pierpont Finch is a most unusual protagonist, particularly for a musical comedy. At face value his single minded behavior, drawn exclusively from a self-help paperback, can really only be described as sociopathic. He manages to manipulate everyone around him (with the exception of Rosemary, the woman who loves him) precisely because he is able to appear so unassuming and guileless. Though not as demonstrably dangerous and considerably more cuddly, he shares a lot of the same personality characteristics of Jake Gyllenhaal’s Louis Bloom in the 2014 film, Nightcrawler. But thanks to Robert Morse’s demeanor of innocence and boyish vulnerability, we as the audience are as taken in by him as are his co-workers. The songs by Frank Loesser (Guys and Dolls) include the sublime, “I Believe in You” which serves both as Rosemary’s declaration of love for Finch, as well as his own self affirmation during a crisis of faith in the executive washroom as the other top managers simultaneously conspire against him (“Gotta Stop That Man”). The choreography by Bob Fosse is, as always, a pleasure to watch and also brilliantly serves the ensemble number, “A Secretary Is Not A Toy”. *Please Note That we are starting 30 minutes later than usual due to Daylight Savings Time, and the issue with ambient light at Mother’s Velvet Lounge.